When I read the description of Go Far – The Christopher Rush Story and watched the trailer, I knew it was something that I wanted to share with you. Go Far is a Dove approved film. Watch the Go Far trailer below! 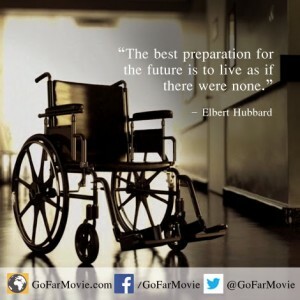 Go Far chronicles the inspirational life of Christopher Rush, a paraplegic, and national MDA poster child, who lived with muscular dystrophy from birth to death at the age of 30 and spent his life inspiring and teaching others how to overcome even the most seemingly insurmountable obstacles. Personal stories from celebrities like Tony Orlando and Jerry Lewis are featured, along with footage of Christopher throughout his life. Go Far is narrated by Mark Hamill. 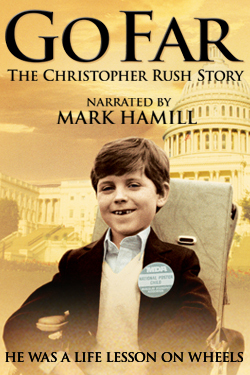 Go Far – The Christopher Rush Story is very moving, and inspiring documentary for the whole family to watch together. Everyone will be inspired by Christoper’s story in his own words, and with footage of him throughout his life. If wheel chair bound, quadriplegic, Christopher can get his scuba diving certification, we all can work harder to accomplish our goals and dreams. A great lesson for kids, and a great reminder for adults of all ages. I was very impressed with Christopher and his story. This is a motivational story that will teach and inspire not only persons with disabilities, but everyone, to follow their dreams and achieve them, no matter the obstacles. Christopher graduated from college. Think about this for a minute. He was a quadriplegic. Every time he turned a page in a book, he had to ask someone to do it. Every thing he highlighted, he had to ask someone to do it. He couldn’t take his own notes, or look them up himself when he wanted to study. How easy it would have been for him to quit. How determined he was to keep going, no matter how hard it was. I encourage everyone to watch this documentary. Make sure to include the kids and teenagers in your life when you do watch it. Go Far The Christopher Rush Story is a story worth sharing. 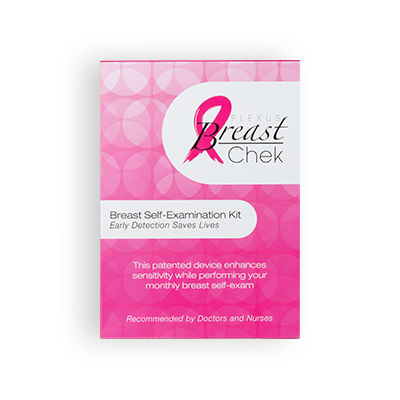 “Disclosure (in accordance with the FTC’s 16 CFR, Part 255: “Guides Concerning the Use of Endorsements and Testimonials in Advertising”): I was not compensated for this post. I was able to watch this movie online prior to its release so I could review it. My opinions are my own.